Bird watching and Hunting is a way of life or a simple hobby, whichever the case, sight is everything in the game of hunting. It is necessary that you have the proper vision in order to see your prey before your prey sees you and then runs for the hills. 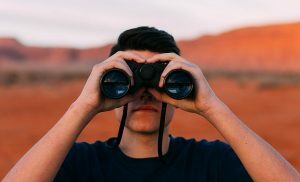 In this guide, we will go over all of the pros and cons when it comes to the Best Binoculars in 2019 on the market for hunting, Bird watching or any other thing. Hunting is a big endeavor and journey. When you can see your prey better than ever, your target and aim will likely be spot on! You need to make sure that you equip yourself with the right gear before you head out into the wild. Once you are fully equipped with the best binoculars on the market there will be no stopping you! There are plenty of features you need to look out for before you purchase binoculars. Spending your hard earned dollars on something that does not work properly should never happen, this is why we’ve laid out a guide of best binoculars under $100. Pay attention to several vital features and capabilities before you indulge and invest in new binoculars. is important to have lens coating binoculars for the mere fact that if you don’t, your lens could lose color. If you do not opt to get a product with lens coating, you will miss out on extremely clear and beautiful HD images. Since you will be looking through your binoculars for very long periods of time, you will need a quality product that offers complete relief for your eyes. Over time our eyes get tired, especially if we are constantly looking through lenses. You need to find binoculars that offer comfortable eyecups, this proves certain for those of you who wear eyeglasses. When it comes to size, it matters depending on your personal preferences. If you prefer a larger style of binoculars, you must keep in mind that heavy binoculars may weigh you down on your hunting excursions. It is wise to choose something that fits comfortably inside of your pack or around your neck. Below we will discuss the pros and cons of several binoculars that we’ve tested out over the years of experienced hunting. If you are looking to keep your gear light than this brand will be a good choice as it offers a lightweight appeal along with ergonomics that aide your eyes to see everything on the field no matter where you are—high or low. The rubber eyecups make these binoculars comfortable for your eyes, especially since hunting takes a lot of time. Hunting is no walk in the park. Utilizing this piece of equipment will help you catch the best prey possible. If you prefer clear images, because let’s face it, this is a necessity, then the Nikon 8245 Aculon A211 8X42 Binocular (Black), will offer just that. Not only are these binoculars easy-to-use if you are not a professional hunter, they are simple for newbie hunters as well. A sturdy rubber grip and a weatherproof capability ensure these bad boys can be used all year round. Since the build is entirely armored, you can rough these up and you won’t see a scratch. Not only are these binoculars under $100 dollars, they are constructed with Aspherical multicoated Eco-glass lenses that provide clear-cut images that shine brightly. Although, you will most likely see clearer images as long as you use these in sunlight conditions. Since these binoculars do not exceed two pounds, they are a go-to essential to have on any hunting trip you go on. It is important to have tools that do not weigh you down and have capabilities to help you become a diligent hunter—these binoculars are worth every penny. Needless to say, the magnification levels this product offers is cutting-edge. The shape and cut of the glass are precise and the satisfaction level these Nikon’s offer are reliable and unbelievable. Whether you are hunting deer, hogs, elk, you name it, these binoculars will aide your shot with a solid target. The zoom will enable you to hit on target, every time you aim and release. Since hunting is your sport, it is imperative to get close and personal to your target, these binoculars allow you to do this, without scaring your targeted prey away. As a hunter it is wise to support the eco-friendly movement for health and earthly purposes. Whether you need to get river deep, these binoculars offer a solid build. They don’t fog up like other binoculars, it can get entirely annoying if you spot your prey, then unpredictable weather conditions ruin your sight due to a foggy lens. With these Bushnell’s this event will be irrelevant. When you are hunting, you will need HD clarity, this way, you can target your prey in the right spot, enabling a clean and quick kill each and every time you aim and shoot. Since the material is 100% tested by outdoorsmen, you will be offered utmost quality when it comes to this product and brand. 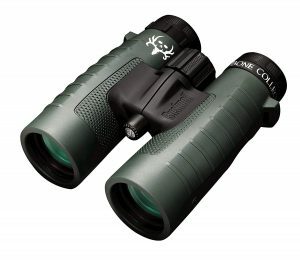 The durability this brand offers allow you to keep these binoculars for the long haul. The design lasts longer than anyone ever expects. Nitrogen is purged into the O-ring offering a fog-free capability, providing you with tremendous hunting results. If it rains, these binoculars can withstand wet conditions no matter where you are. The multi-coated optics allow you to see clear-cut, just in case, you are hunting a fast hog and need to strike it right behind the shoulder. As you know, if your prey spots you for one-second, chances are, you will miss your precise hotshot. The field of view this brand provides is 305/102 feet/1000 yards and 1000m. The BaK-4 prisms constructed on this design allow you to see images you’d dream of seeing with your naked eye. The light transmission that hits your eyes, allow you to see intricate details with a pin-point type of appeal. In the summer months, the heat can get excruciating which leaves us sweating profusely on the field, this then leads to sweaty hands that slip, while you are scoping out your next shot. These binoculars offer a specialized no-slip rubber that is covered in armor protection and enables all hunters to have an entirely firm grip no matter the sweat and outside temperature. This pair of binoculars offers an ability to have a wide-angle field of view, has lens coating and anti-reflective lens, this way you see your images brighter and more clear. Although, you will have to focus these binoculars on your own because there is no autofocus feature that exists on this product. If you have issues focusing your binoculars than we highly advise you to practice using the center knob, ready to focus. The rugged build allows you to rough it out in the wilderness, no matter what you are doing—climbing, scaling rocks, diving, running, crawling, walking, etc. This product is manufactured with UV protection which ensures your product does not corrode or become damaged by the sun. 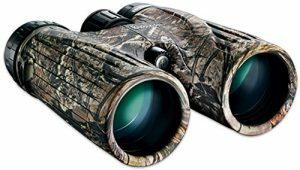 You will be entirely surprised by this set of binoculars and how well you can see faraway images that you will most likely take these out to not only hunt, but, to see the beauty the world has to offer. If you are hunting, take a deep breath, enjoy your surroundings, and begin to bird watch. Listen to the calm nature that surrounds you. From bird watching to deer hunting, you name it. Soon you will be able to see everything and anything. The fact that these do not autofocus can be limiting when it comes to being flexible, versatile, and on the move. Some hunters who have tried just about every binocular can agree that the focus on this product can be a bit hard to focus—if you are not a professional hunter and a focusing pro. You may get annoyed if you are having problems with this product because it is not exactly built for comfort. As we get to be older hunters and wiser, comfort becomes a necessity, because when hunting is your hobby, you are constantly trying to perfect your hobby, therefore, you will always be in the game. This means that you should make sure to invest in the comfort for your body, via your equipment, otherwise, your future self will pay for it, and not in a good way. Make sure not to strain your eyes. Take care of all of the organs you have, eat right, stay fit, and UV protect your eyes with these solid binoculars that offer a manufacturers warranty—making this product an ultimate investment. If you are looking for a high-powered look for your hunting adventures this product is a good choice. These binoculars are sleek to the touch and are non-slip; the protective armor can absorb shock, just in case they accidentally hit the ground, which is highly possible when you are roughing it out trying to catch your free range. This Bushnell product offers a lifetime warranty, so if anything happens to these optics, it is assuring that you will never waste the money you work hard for. This product enables views that surpass 1000 yards and offers a 170-feet field of view. The fact that these binoculars are multicoated, you will gain light enhancement, so you can see details that pop out, whether you are looking at the details of a deer, hog, the beautiful nature, or the birds and the bees. If you have a hard time focusing your optics, you’ll be happy to hear that these binoculars offer a 1-touch instant focus feature, which provides extremely sharp focusing. This feature is patented by Bushnell and helps this product stand out for its uniqueness. These binoculars are heftier than others on the list. If you are planning on putting these optics inside of your shirt, jacket, or pant pocket then this would not be a wise brand to purchase. To keep these particular optics in tip-top shape, you should probably store them around your neck or in their delegated case for maximum protection. With a limited lifetime warranty, this proves this product is number one for customer service satisfaction. Focusing binoculars can be hard especially for newbie optic users, but this product provides an easy 1-touch instafocus that helps you see everything with the best clarity. It is always wise to see what is around you in the wilderness with a good pair of binoculars, whether it is dawn or dusk, the timing can get a little spooky, especially if you are alone. Utilizing Bushnell Powerview Super High-Powered Surveillance Binoculars helps you secure the whole area, this way, you are not shocked if you see a ravaging animal headed your way. It is better to be prepared than not. Hunt your prey now! As you may know, Olympus has a great reputation and has been around for a very long time. This product certainly lives up to its reputation as it allows you to have complete eye-relief with a close focus distance—13.1 ft (4.0), a prism type BK-7 Porro/field of view totals 1,000 yds, 429 ft (130.8m). The weight of these binoculars is 25.0 oz (710 g), this product has anti-reflective lens coating, which help illuminate your eyes with bright imagery, creating easy focusing. The UV protection this brand offers help you worry less about the sun and its damage on your equipment, although, on a side note; it is important to wear sunscreen when you are out hunting in the scorching sun that beats down. The Olympus Trooper 8×40 DPS 1 Binoculars, offers a rugged build and sure-grip made with rubber, which helps you out when you are either sweating from the sun or the rain starts to pour down on you—you will not drop your optics. The dimensions are 139 mm x 182 mm x 58 mm. If you are looking for sharp and clear optics that give you a wide view of your surroundings, then making this small investment will help you hit your targets with pure ease. If you are not solely looking for binoculars, but you are on the market for the whole package, then you found the right brand, as this product offers a neck strap, 4 lens covers, and a soft carrying case. You don’t have to worry about scratching these binoculars as you will be able to freely carry them on your neck, the build is meant to withstand rugged use. We highly recommend these optics for beginners. If you are an excellent hunter and plan to keep these optics up for the long run, it is always wise to protect your investment with a lifetime warranty, no matter what. It is obvious, bulky binoculars can and will get in the way of your main goals to execute your prey. When you are out in the woods, you need to be able to quickly maneuver through bushes, trees, dirt, rock, water, all of it. This compact set of binoculars will help you keep your hunting journeys simple. These are so small that you might as well fit them in your cargo pant pocket or your jacket, whichever is more comfortable. Not only will you be able to see your target before they get anxious that something is watching them, you will be able to strike right on target as you can reach for these optics in a moments notice. Your wide field of view gazes out 1000 yards, which is very far, considering how small this product really is. 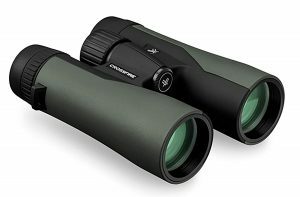 The 8×32 magnification enables you to see a strong detail that you are unlikely to see with other small-sized binoculars. Never worry about dropping this product, as the no-slip grip, aides your hands and finger dexterity at all times. The lifetime warranty is a hot commodity, considering you will be able to protect your investment the moment you buy this product. If you are an expert hunter, these binoculars will be all that you will ever need. After all, you will be carrying your ammo, gun, or your bow and arrows, it is imperative that you don’t let any of your other important tools weigh you down in any manner. With crystal clear HD focus, along with a lightweight feel, and waterproof durability, these binoculars do the job and some. Just when you thought you could not find smaller and more compact binoculars, the makers of Nikon prove you wrong. The best part about this product is that the long eye relief allows you to look through the lenses for hours on end. Hunting isn’t easy, patience is always your best bet. If you are an eco-friendly individual, you will be happy to know that this brand offers eco-glass lenses and prisms. This means that your lenses will be arsenic and lead-free. Due to the fact that these are waterproof and fog proof, you will be able to use these in any type of terrain. The construction offers a sleek build and a light frame. The magnification levels top 10x, in case you want to zoom into your preys eyes, right before you release the trigger. The objective diameter is 25 mm, while the field of view offers 1000 yds; close enough to feel as if you are standing right in front of your prey. Since the close-up view is incredibly precise, you may feel as if you are watching an HD movie while you peep out onto your prey in the wild nature. As some of you hunters know, it may be easy to fall asleep while you are waiting for animals to pop out of nowhere, but not with these. Watching a movie on mother earth unravel could prove to be a fun experience, as these binoculars make you feel as if you are watching something on the big screen. If you love detail and complete entertainment, then this product will be for you. The lifetime warranty proves that the Nikon manufacturers care about your product and the quality build they provided for you. We highly recommend this for hunters who are beginners, as the eye-relief is not offered. Seasoned hunters need to relieve their eyes. We don’t recommend these for hunters who stare into optics 24/7 though, as this version doesn’t offer eyecups that comfort your eyes. This product is meant for those of you who are avid hunters and want something more than just any binoculars. The fact that this brand comes equipped with a tripod adapter helps you become the professional hunter that you have always dreamed of. A large aperture helps you in a low-light type of conditions, so you don’t have to restrict yourself for daylight settings only. Whether you want to target your prey in the dusk or dawn, there should be nothing holding you back. If you enjoy stargazing after you have targeted your prey and you are camping for the night, then use the large aperture to perfect your viewing needs. The tripod adapter offers an ability to be hands-free when you want to take it easy. Luckily, if your eyes get tired, the long-eye relief helps your eyes whether or not you wear eyeglasses. A diopter adjustment allows you to finely focus your views, making this product a top-pick for seasoned hunters all around. There is an angular field of 4.4 degrees that allows you to not miss a single animal sighting. The Celestron SkyMaster Giant 15×70 Binoculars with Tripod Adapter includes a large 70 mm objective lens, which provides the opportunity for you to see optimal brightness whether you are viewing long-range or low-light areas. For those of you who not only love searching for hard to find prey, but enjoy nature, plus you are an astronomy nerd/hunter, these binoculars will be the best choice around. The build is sleek, yet incredibly sturdy, this product is easy to adjust, all while, the focusing features offer quick and easy capabilities that will leave you happy with your final binocular hunting investment. The fact that various accessories are included help put your mind at ease. The manufacturers care about the quality of their product and the entire build. The extra accessories include a rain guard, neck strap, soft carrying case, lens cloth, objective lens cap, tripod adapter, a manual and instructions are also included. These black sleek version binoculars offer a durable build that is hard to drop, due to the fact that this product has a ridge type of grip. The clarity that is provided helps you maintain the utmost clarity that lights up images for crystal clear sight. This product does not need to be adjusted. Bushnell PermaFocus Wide Angle Porro Prism Binocular offers a different type of focus-free capability that maintains its dialed focus for instantly viewing faraway distances. The PermaFocus feature enables you to magnify your binoculars for the best crisp images. This neatly designed product offers exceptional lighting transmission along with fiery brightness due to the fact that they are built with fully coated optics. As a newbie hunter, you may have trouble focusing your optics. With this brand, you won’t have to worry about this, as a focus-free option is available at your leisure. For this fact alone, we don’t recommend this brand for professional hunters, as we know, professionals prefer to focus and amateurs need help with this option. It is important to note that the focus-free option is mainly for distant objects. The non-slip armor is built with rubber material and shock resistance which provides absorption, all while offering you a firm grip on your binoculars. The Bushnell brand is known to yield tremendous results for optics and has been existent for over 50-years. If you are looking for binoculars that work with complete quality, reliability, and affordability this brand supersedes its value. Although, a lifetime warranty is not offered, this may steer professional hunters away. It is easy to accidentally damage your binoculars out in the wilderness, from running to crawling, diving, you never know what you may have to do. Luckily, this product is ergonomically designed for the best binocular comfort around. With a 10x magnification option you can finally allow yourself to see the unknown. Of course, you will never be able to see the detailed quality, life has to offer with simply a naked eye. This brand offers a Bak-4 prism eye-relief (14 mm), is waterproof and fog proof, in case you decide to hunt in the winter, spring, summer, or fall months. Another wonderful and unique feature this brand offers is eyecups that twist-up and adjust according to your preference. The adjustment process proves to be simple and quick. A neoprene pack eradicates moisture, allows you to carry these binoculars on your neck via the strap that is provided with your purchase. 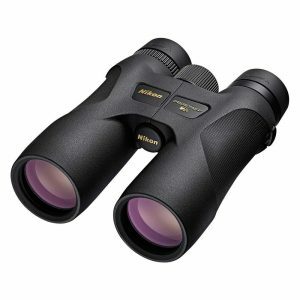 The Celestron 71347 Outland X 10×42 Binocular (Black), aides all hunting enthusiasts with a wide field of view, wider than most binoculars on the market. The multi-coated lenses provide contrast and brightness that exceed your expectations. Not many people know how beautiful large fields, trees, bushes, and animals can really be, this is most likely because a majority of people do not get outside much. As a hunter, these binoculars will show you imagery you’ve never imagined, you will start to see mother earth in a whole new way. Once you invest in this brand, you may have trouble pulling yourself back indoors from the detailed aesthetic beauty that you’ll see. The great feature about this product is that it is meant for the pros and new hunters. This product is meant to supply you with pure optic function that works. When our gear does a job well done, we are able to complete our hunting missions—killing our spotted prey. With a high-quality build and myriads of extra accessories, this product is flaming, for those of you who prefer to see everything close and far. Remember, being able to predict what prey is in your territory can be a matter of life and death in the world of big game hunting. For those of you outdoorsy lovers who prefer camouflage patterns, these binoculars are different then all of the other ones above. With HD clarity you will feel as if you are hanging out with one of the animals—your prey. These optics are built to last for the long-run. With a 10x magnification option you can see everything up close and personal. If you prefer eye-relief, which you should, considering, your eyes may tire out long before you are able to catch your prey, then this branded product has fold-down eyecups—for those of you who happen to wear eyeglasses. If you truly want to remain blended into the terrain, then it is a wise idea to grab these binoculars that will go unnoticed. The focusing bar is placed in the middle of this design and allows for easy accessibility. You won’t have to turn the knob and you will still be presented with a bright and clear image. These optics are perfectly constructed to fit your hands and grip with comfortability. In the rain, these optics can sometimes fog up on a rainy or humid day. Of course, if you aren’t a hunting pro, this fact will not bother you at all. If you are a hunting professional, then just know, these binoculars should be geared towards hunters in training, because let’s face it, the price is affordable, and you never know if the new hunter will stick with the sport to begin with. The condensation that builds up will irritate any hunter, you were warned. If you live in a dry climate, these binoculars work at giving clear images and good focus. They have a slight bulky fit, which may weigh you down on occasion, but as mentioned, only buy these for the newbie hunters; keyword—trial and error. An extremely lightweight design, that is 100% fog proof and waterproof. These optics have a premium lifetime warranty, you will never have to fear accidentally destroying these precious binoculars while you are in out the rough terrain. The field of view reaches 1000 yards/340 ft. and provides an angle of 6.5 degrees. At first glance, it is hard to tell just how light these binoculars are, they weigh 9.9 ounces, and offer a 12.5 mm eye relief. If you are looking for optics that fit in your shirt pocket, this design will certainly do. Not only are these built to last a lifetime, they literally offer a Premium Lifetime Warranty, which states just how effective and durable these binoculars really are. If you are constantly out in the wide open fields, then we highly recommend that you look at utilizing the Vanguard Orros Compact Waterproof Binoculars, Black, for the fact, they are compact. There are no small compartments or components that can fall off of these optics, they were built with a sturdy and protective form. If you are deep into ergonomics, which you should be, especially when it comes to your long-term health; these binoculars may lack this aspect. Although they do the job and they work well, this doesn’t mean they are entirely made for comfort. If you happen to be hunting and traveling fast, these optics will work, but they are certainly not for staring ahead at your prey for hours on end. If you are a comfort hunter, then these optics will not subdue your need for being comfortable on-the-go. The focus has been known to be tricky, you must focus it just right, which can be a little time-consuming. Other brands that have the Insta-focus feature prove to be much for efficient and effective when it comes time and sight. If this fact doesn’t bother you, and you can focus any type of binoculars, then this can be a good addition to any hunters kit. These binoculars are beautifully made with a sturdy appeal. The high-quality HD clear images allow you to dart your arrow straight into the heart of your prey, killing them on the spot. The materials are 100% tested by the pros to ensure accuracy and good quality. The design lasts for decades to come. 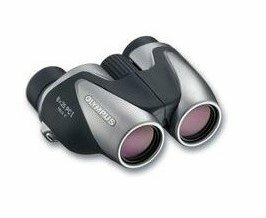 These binoculars have the ability to zoom with a magnification of 10 to 22x. Luckily, these are coated with rubber armor to absorb shock from rough use. The grip is durable and provides you with security and peace of mind. We all know by now, how important it is to have eyecups that twist-up, just in case your eyes need comfort, which they will if you are out on the field for days or months. The focus tool is located in a handy center spot, these are 100% fog proof and waterproof. There is also a limited lifetime warranty, which further proves the quality these binoculars were built with. This shiny new product needs to be carefully taken care of. As you can see, the build is intricate and there are many components involved. The fact that this product comes with a case and a shoulder strap, you can rest assured that you will keep these new optics looking brand new as can be. If you are not the type of hunter who avidly takes care of your gear, then we highly recommend that you retrieve a different product, for the mere fact that you may break these by accident. On the contrary, if you happen to be finicky about all of your equipment, then it is wise that you take care of these in order for them to last the lifetime that they were meant to. Luckily, if you ever have an issue with this product, Bushnell will gladly refund you with a working pair of binoculars. We can’t stress enough how important it is to protect your hobby, your bank account, and your hunting investment with warranties. The Bushnell brand was made with high-strength material inside and out. The HD picture quality will leave you in wow of the outdoor beauty that surrounds you. With a light grey and black look, these binoculars are made to fit for ultimate comfort. 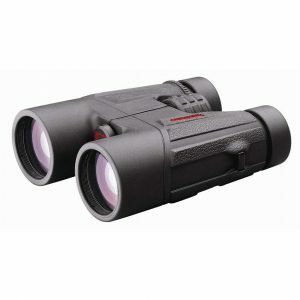 This set of optics comes equipped with 10×25 magnification, the lens is fully coated, there is a 1,000 field of view which is ideal for seeing animals deep within the fields or woods. The prism system offers a roof; the eyecups fold up for ultimate long-term user comfort. If you are into looking at fine details, then these binoculars pick-up the smaller things in life. You never want to get too close to your prey, otherwise, you will scare them away—it is important to stay back the right amount of distance. Not only does this product offer image quality, it also provides a size so compact, you will forget you are carrying this extra piece of equipment. In case your new optics drop onto the dirt trail, your product is armored with rubber in order to absorb the shock from the fall. A soft case is provided for binocular storage. With this product, it is small enough and coated with rubber, which minimizes possible scratches that may occur. The 10x magnification is all that you need to see the closest type of detail you’ve only dreamed of. This brand is high-powered with features that allow it to work whether it is dawn or dusk. Although, the image can come off a bit dull, as opposed to other brands, the compact sizing this product offers makes up for the lack of brightness. The price is affordable considering how many decades upon decades these optics last. Not only do these fit in hunting shirt pockets, they can also fit into truck or car glove boxes, so you will never leave this important hunting piece behind ever again. A neck strap is provided—it could be made with higher quality material to ensure greater durability. If you are searching for pure clarity and this is your main goal, these binoculars do not offer this full feature. The best quality these optics offer is their compact nature. Just when you thought binoculars couldn’t be more lightweight, they finally are. Whether you are on a long-term excursion or a short weekend hunt, these optics sure do help you see not only the deer that pass by, but rabbits that scurry along in the large open fields. The magnification is 8x and includes a 25 mm objective lens, the 315-foot field of view allows for you to see long past 1,000 yards. With this brand, you will be previewed with a crisp image that picks up the strong light transmission with high-index prisms that relay brightness supremely. Since you will be out on the field for long periods of time, the twisting eyecups allow you to have personal comfort day in and day out. The dioptric correction and focus knob allow you to easily situate your zoom and focus. This brand was built with pure style and is so cute that you can fit it in your pocket. Whether you are deep in the woods or scouting locations for your next hunt, it is imperative that you utilize this easily accessible and a simple-to-use pair of binoculars. The lens material will keep dangerous UV rays out of sight and out of mind. Luckily, you can adjust these binoculars for your own personal comfort and use. The BaK-4 prisms allow for an HD quality picture. For being so incredibly small, these optics sure do offer a bright and clear image because of the high-index prisms that are designed within. Not longer put up with seeing through dark optics. This doesn’t have to be a pricey endeavor either, make sure that you know about the Olympus Tracker 8×25 Porro Prism Compact & Lightweight Binocular, especially if your goal is to stay bright and small. It is also important to note, spending large sums of your money does not equate to brighter or better binoculars, what it comes down to, is preference, affordability, and optics that are tested and proven to work. Hide these away in your hunting jacket for a quick draw—as soon as you have an inclination that your prey is near. Nikon is one of the best brands when it comes to quality binoculars. These binoculars are known to be ergonomically satisfying. The grip is solid, the magnification can be adjusted from 10-22-power, and the rubber eyecups provide a comfortable nature for your eyes when you are using these for long hours. These binoculars function perfectly well in wet weather conditions, while the eco-glass lenses are multicoated, which helps deliver brighter and clearer images. These binoculars are light in weight, weighing in at around 2 pounds, which makes them easily mobile for all outdoorsy types who don’t like to be tied down by heavy hunting equipment. Some binoculars provide unclear imagery, these don’t. You can easily zoom in and your focus isn’t changed, the same clear view will still be in sight with the Nikon 8252 Aculon A211. These binoculars also come with a padded case to keep your gear protected and safe, a neck strap for ultimate comfort, a lens cover, a belt loop, an adapter, and a tripod. The extra perks the Nikon offers is worth every single penny spent. Take these binoculars out on the field if you are an expert hunter, but adjusting the focus on these can prove to be a bit testy. If you are a binocular connoisseur then you shall have zero issues. These particular binoculars have already been tested by the pros—extensively. Quality HD clarity is provided when you use this 100% quality device. The magnification is superb and goes up to 10x, with a 42mm objective lens. The Bushnell binoculars provide a camouflage look for those of you who enjoy blending into nearby terrain. The durability enables you to take these binoculars out without worrying you will break them every second. These were made to be in rough conditions, they offer a RainGuard HD water-repellent lens, along with a lightweight feel and soft touch. Of course, hunting can take a lot of time, there is a lot of sitting and waiting; with these high-end binoculars you will never have to worry about discomfort again. The weather is precarious, another important feature the Bushnell Legends offers is, fog proof build. Includes a neck strap and soft case for safe keeping. HD clarity is important, as seeing is life. These binoculars help your vision become sensitive and alert. In order to see your prey better, it is imperative that you have a good pair of binoculars, otherwise you may go home empty-handed. Hunting requires patience. With the best binoculars, you can increase your chances, target your prey, and boom, your prey is all yours now. The lenses are perfect for promoting light and clarity to the user’s eyesight, due to the multi-coated feature that is offered. Think of wide-depth of fields along with enhanced vision, when you think of the Vortex Optics. The twist-up eyecups offer eye comfort to the tee. If you are the type of hunter who prefers complete precision, then it is wise that you invest in binoculars that offer a diopter. The Vortex Optics provides a right eye diopter. No matter what weather you are dealing with, these binoculars offer a no-slip grip with rubber armoring, they are waterproof and offer fog proof protection. These binoculars offer optimal clarity along with utmost durability. The lifetime warranty alone, states how high-quality these binoculars actually are. The pricing is a bit higher than other binoculars on the list, which can be a bit of a setback for some, but if you are into quality, these binoculars are a good choice. Easy to adjust for beginners or pros, the glass is clean and cutting-edge; these opticals improve sight all around. Catch your next prey any time of the day with these durable and reliable binoculars. Another plus is that you can choose to use these with or without your sunglasses/glasses on. If you are a binocular connoisseur then you will enjoy the Bushnell Legacy, as these offer elegant design, along with durability that lasts in the rugged and unpredictable weather. The twist-up eyecups offer long-term eye relief for those hunting days when you are eyeing your landscapes for hours on end. 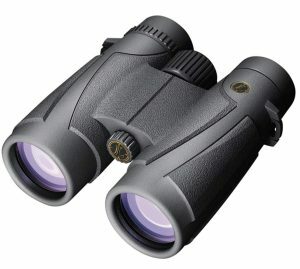 You can adjust your zoom to 10-22x magnification, these binoculars also have 50-millimeter objectives. The rubber material they are made off provides a secure and strong grip. With a 100% lifetime warranty, you can gain full peace of mind if anything ever happened to these sturdy binoculars. Stop buying binoculars that claim they are fog proof and they really aren’t. The Bushnell Legacy’s, a legacy that lives up to its name. A powerful build that comes with a lens cap, a cleaning cloth, a soft padded case, a carrying strap, instructions, and a neck strap. You will be fully equipped with exceptional clarity when you are searching out into the aesthetic and wild wilderness. The Bushnell Legacy makes hunting easier and by far, much more visible. The controls are simple to use for beginners to pros, although keep in mind, you must have a steady hand if you want to obtain zooming clarity that lasts. 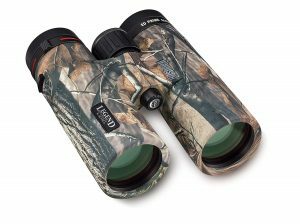 These binoculars are not only meant for hunting, but they are also meant for those beauty seekers that love nature too. They provide clear views, they’re built with rubber armor, which protects these Nikon’s when they are dropped or roughly handled. Roughness is a given while you are trekking through fields and distances that are unknown. If you are looking for clear, these binoculars provide clarity beyond belief, they are lightweight, easy to grip, have an extremely comfortable neck strap. The field of focus is on-point and the magnifying lenses are simple to focus. Needless to say, these binoculars are ergonomically meant to be held with pure comfort. Some binoculars offer lenses that are not as bright, with the Nikon Prostaff, you can finally achieve more vivid colors when you are searching for beauty or prey. Enjoy waterproof and easy to handle binoculars that work with glasses or without. If you prefer to scout out your wildlife with easy focus, then these binoculars are highly suggested, as the crystal clear imagery each lens provides beats many other binoculars on the market. The Nikon Prostaff represents quality glass lenses with stylish effectiveness. Be careful with the lens cover, as it does not provide the best protection. These binoculars are extremely light and economical, providing soft thumb grips, along with new material (new dura-grip rubber), never lose grip or a steady hand when you use the Bushnell Greens. For all green lovers, the glass is lead-free, the lenses are multi-coated and clear as day. If you need to see your prey from afar, which is usually the case, these provide a magnification of 10x and a 42mm objective lens, which helps you see brighter and better. The images are known to be as sharp as a razor. If you are a name brand type of hunter than it is important to know that these binoculars are a Michael Waddell Bone Collector Edition. These binoculars offer nitrogen-purged fog proof and waterproof capabilities, along with an ability to focus your binoculars fast! For objective lenses, flip covers are provided. If you are looking for wide ranges than these hunter essentials are number one. The Bushnell Greens improves visual appearances, close or far. The thumb grips are known to help those beauty seekers and hunters who have a shaky hand. 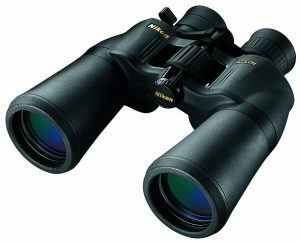 Get the best use out of these binoculars, not only while you are hunting, but perhaps when you are at sea. These binoculars allow you to see the world with a closer and more vivid view. When it comes to hunting, things can change at a moments notice, this is why it is important to have a fast focus wheel. If you are not the type of person who prefers wearing your binoculars around your neck than you should definitely take a peek at the Bushnell Binocular Bundle. These binoculars offer a harness and make sure to keep your optics forward and centered. They are lightweight at 25oz. and offer a 15.2mm eye relief. They are nitrogen-purged, meaning they are waterproof and fog proof resistant. If you are hunting and want to see far past 500 yards, these binoculars are your best bet. The chest strap is very comfortable and the brightness and clear vision these opticals provide is sharper than expected. Be sure to magnify your prey before you attack, otherwise, you may be in for a struggle. These binoculars help minimize threats. If you are a lover of the outdoors, these opticals will only bring better sight and enlightenment to your eyes. Catch your prey by seeing them, before they see you. The quality is noticeable at first sight of these durable binoculars. The lens cover is lacking durability, but the crystal clear imagery beats out this shortcoming. The price is more than affordable for the quality and detail that went into making these top of the line binoculars. If you are the type of hunter who loves everything camouflaged, then be sure to check out these must-see binoculars. The specs are 10x 42mm and offer a 340 ft. field of view. Who doesn’t prefer to see farther than most? These far seeing binoculars give you an advantage, whether you are a hunter, a hiker, or simply a person who likes to see nature. Binoculars have a way of protecting people, perhaps you want to see your full surroundings for pure survival strategies? These binoculars surely improve clarity and strategy. Choosing the Bushnell Legends helps you become the investigator you have always dreamed of. Whether you are a hunter or a high-rise watcher, and you want a perfect faraway sight, then these are for you. Since these particular binoculars do have a camouflaged style, we recommend this to all you outdoorsy types, as we know how much you like to stay hidden in terrain, don’t become your prey’s prey. Of course, these binoculars are made with the highest grade of materials in the industry of binocular devices. They are tested for complete durability by outdoorsy professionals, and they are designed to be waterproof, which helps prolong your hunting trip; rain or snow will not stop you from seeing your location. The lens protectors have proven to be durable, but the covers are not attached to the binocular glasses. These binoculars are easy to use for anyone and prove to be a great gift for those of you who like to hunt deer. Deer are fast and dart in and out of places, with these binoculars, you can see over 400 yards plus, which allows you to strategize your next move when it comes to catching your prey. After all, you must always be one step ahead of your prey. Being that the lens covers are not attached, this can cause a little frustration and can become cumbersome, because while you are out on the field, you have to be quick. It may be easier to lose your lens covers on the field since they are not attached. These binoculars are meant for pure minimalistic purposes. If you are a hunter, then it is wise to invest in these types of optics, especially if you are the type that doesn’t like to carry a lot. The magnification is 10x. They have an objective lens diameter of 42. These binoculars are entirely minimalistic, they take up very little space in your bag and they are light. These optical also provide you with optimal long range sight capabilities. With multi-coated lenses and BAK4 superior prisms, these binoculars are proven to offer brightness, crisp clarity, and resolution that jumps out, almost 3D-like. Make sure to reward your eyesight with binoculars that do more than just work, you need binoculars that provide ultimate sharpness. The eyecups can be twisted upwards or downwards for long-term eye relief and comfort. They can be used by individuals who wear glasses and those who don’t. Luckily these binoculars also include a neoprene neck strap which provides ideal comfort and material for all necks. This product also includes a soft case for storage and lens covers to eliminate lens scratching. The Redfield Rebel offers premium durability. Another camouflaged style type (Aspen Green), these binoculars are solely made to provide relief for your eyes. It usually takes plenty of time for anything interesting to come our way, unless we are lucky; hunting can be correlated to watching paint dry in some instances. Take care of your eyes, they are all you have. These binoculars make sure to provide a close focus of up to 7-feet. Perhaps you want to see rabbits or snakes? Knowing your surroundings will always empower you and aide your long-term survival. This optical provides nitrogen-filled waterproof and fog proof features that shelter your vision. The special offer and promotion allow for 6-month financing. 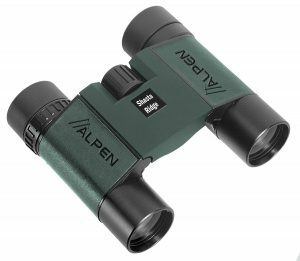 This product offers a compact size along with a clear and bright view, just what every hunter yearns for when searching for worthy binoculars. This product comes with a carrying case, a neck lens, a lens cleaning cloth, covers for objective lenses, and a rain hood for the ocular lens. 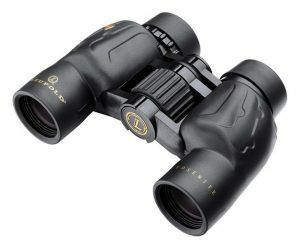 Leupold BX-1 is different than the other binoculars on this list. Although this is a professional device, these binoculars can be used by anyone, including children. The weight is 1.7 pounds, although these aren’t the most lightweight pair of binoculars that we’ve seen. The design has a military-like style. These opticals provide smooth focus, along with twistable eyecups, waterproof protection, they are armor coated for protection, and ergonomically designed for ultimate hand and eye comfort. Whether you want to bird watch or hunt, these binoculars are very easy to use and don’t add any unwanted weight. For a low price, these binoculars offer more features than the cost suggests. The eyecups are close together, hence why they are effective for children and adult use. The Leupold BX is so easy to use, a child can use it. Providing adjustable focus and sharp visuals. 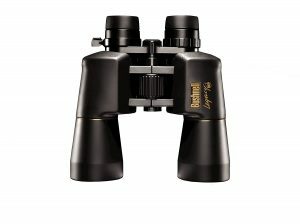 The Leupold Bx is a great gift for an adult or child who enjoys the wonders of the outdoorsy world and needs an easy binocular device to use at any given moment. The eyepieces come with a rubber cover, which is strong, durable, and lasts. A soft padded binoculars case is included, keeps the opticals clean and helps with scratching. These binoculars should not be strictly used for hunting, of course, use them solely for hunting if you want, but we recommend to use these binoculars for all types of different sports, such as archery, shooting, golf, hiking, you name it, you choose. Teach your child to use the Leupold Bx binoculars, they are a good starting point. Looking at such a long list of binoculars can sometimes be daunting, especially since so many of them have such similar capabilities and features. In this list of twelve different types of binoculars, our favorite choice is the Bushnell Green Roof Trophy Binoculars, 10×42 binoculars. We choose these binoculars, simply because they offer everything all of the other binoculars have to offer plus more, we especially enjoy the soft thumb grips. We are avid hunters and hikers, so we are aware that all devices have the tendency to slip and fall, but not these binoculars. These optical provide a lightweight feel and new dura-grip rubber, which saves us time and money in the long-run. They are a collectors edition, offer sharp razor-like images, and magnification that is proven to be clearer than most other binoculars on the list. You are going to be out on the field for quite some time, it is vital that you invest in comfort, otherwise, giving up may be your next solution. Hunters never give up. Happy hunting and make sure to use the best binoculars in 2019 around in order to see all of your surroundings. After all, you don’t want life to pass you by; in this case, you don’t want your animal prey to pass you by.